2013 - A Great Year for Watford! This past year has seen some great developments for Watford. We have had the green light for the Croxley Rail Link, new schools open, new health facilities, and redevelopment of the High Street to name but a few. A lot of this year’s successes however have also come from something The Best Of often try and celebrate, our local businesses. Watford went into 2013 having been named as the place where more businesses had been started over the previous year, than anywhere else in the UK. Thanks to the dedication of local people, employers, and of course organisations such as the Chamber of Commerce, this momentum has continued to grow. Just this week I invited the Chancellor, George Osborne, to visit Watford and meet one of the many companies who have recently set up here, Morrisons on Ascot Road. As well as the Chancellor being shown by new employees some of the more practical side of what they do (and I’m sure he enjoyed layering a sponge cake at the bakery!) we had the chance to discuss upcoming apprenticeships, new employment in the area, the positive effect that the new Ascot Road station will have, and some of the measures announced in the Autumn statement to help support businesses. These included action to tackle rates, boost qualifications, and cut national insurance bills to encourage further employment. 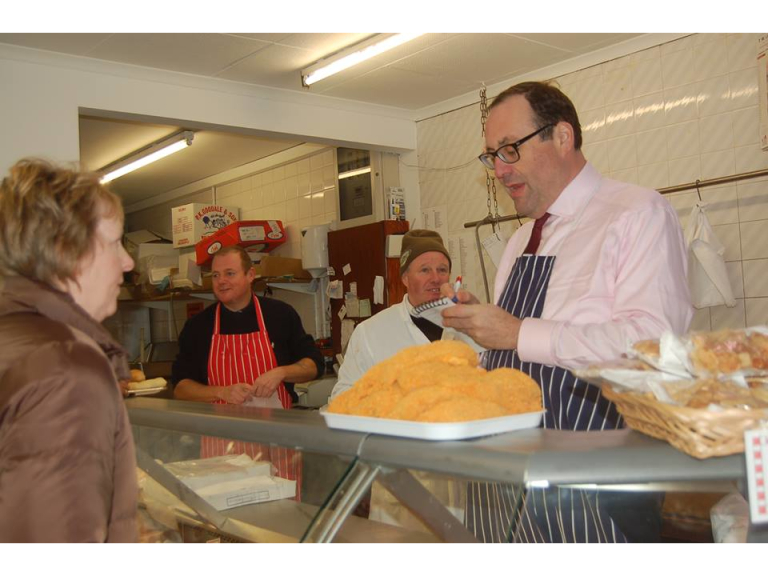 This led on from Small Business Saturday which had been held just two days earlier, and saw a great national effort to support small and local businesses throughout the county, it also allowed me to don an apron and serve some customers at Simon East Butchers in Abbots Langley which was good fun! With all of this investment in Watford throughout the year we have seen some good results for local people, including that youth unemployment is down 35% on last year which is really positive. I think 2014 will continue to deliver for Watford, and don’t underestimate the role that our local employers and businesses will inevitably play in this. I’m hoping to report back next year with some more positive news (hopefully on Watford FC too!) but in the meantime, I hope everyone has a very merry Christmas.